Back in 2009, I posted a couple of notes here about the European Space Agency’s [ESA] Planck Observatory, The observatory operates in the microwave part of the electromagnetic spectrum, and is intended to make the most precise measurements yet of the Cosmic Microwave Background, a faint remaining echo of the aftermath of the Big Bang. At the time I wrote, the spacecraft had just gotten ready to work, having reached its normal operating temperature of 0.1° K (-273.05° Celsius), just above absolute zero (0°K). According to an article at the BBC News site, the Planck has now completed a 15-month sky survey, and the ESA has released a map of the results. A spectacular new map of the “oldest light” in the sky has just been released by the European Space Agency. Scientists say its mottled pattern is an exquisite confirmation of our Big-Bang model for the origin and evolution of the Universe. The Planck data have also confirmed some small anomalies that were previously noted in the data from NASA’s Williamson Microwave Anisotropy Probe (WMAP). 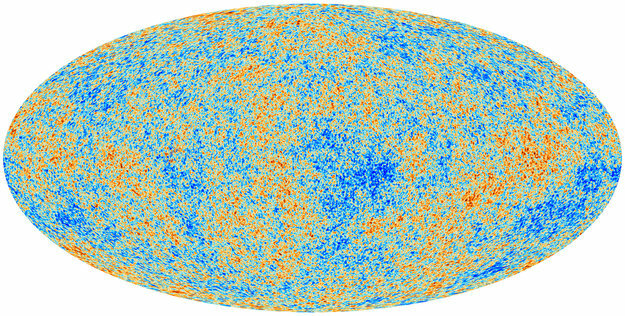 According to the theory, the differences in the level of background radiation (represented by the color “mottling” of the map) correspond to differences in the density of matter in the early Universe. In the CMB map, above, the lower half of the image seems to be slightly warmer (orange / red) than the upper half; there also seems to be a cool spot (blue) just below and to the right of the center. The reason for these anomalies is not known; they may hint at some new refinements to the underlying physics, or perhaps result from another, unknown microwave source. Taken as a whole, though, the data seem to support the current models of the development and expansion of the early Universe. Ars Technica also has an article on these results. You are currently browsing the Random Walks blog archives for the day Thursday, March 21st, 2013.